Building a sense of learner agency in the library begins now. Whenever I consider the concept of student agency I am always drawn back to “Choice words : how our language affects children’s learning” by Peter H. Johnston, 2004. In particular, chapter 4 “Agency and becoming strategic”, in a very concise & practical way clarifies what student agency is, what it looks like and how we can have a powerful impact on learning. For such an identity to become viable, students must be convinced that they can act with effect & affect. Identity is tied inextricably to agency by the ability for an individual to see themselves as the kind person who, when faced with a challenge, has the will to face the demands of that challenge and the capacity to develop the abilities to tackle parts or all of those demands. This is why agency is also tightly bound to a growth mindset (Carol Dweck). We form our identity through stories about ourselves where we see ourselves as the active protagonist with the ability to effect change. The opposite is for us to take a passive role, to take on the identity of compliant and submissive obedience as a victim of external and sometimes internal forces over which we can have no effect. Student agency means that learners are in control and feel in control of their own problem solving process. Our task as educators is to help them to build an awareness of their own identity as independent thinkers. Not to tell them how to think but help reveal their thinking, by reflecting back to them what we are observing, to notice and name their acts of problem solving. Such feedback builds a metacognitive awareness that reinforces their identity as an agent of their own learning, as the constructor of their own understanding. This is in profound contrast to the perception that the teacher is the learning expert to be deferred to at the onset of the unfamiliar or challenging. Building in the learner their identity as the expert in their own thinking breaks down the traditional hierarchical structures of power in the classroom. Furthermore, failure in the process of learning is essential to the development of agency. When initial attempts at a task do not produce the predicted or desired results, a negative disposition toward failure undermines the potential in these moments for deep learning by stunting the growth of learner identity at a very fundamental level. In contrast, a sense of agency will always bring learners back to a challenge where they are able to refine their approach, build new skills and understandings, and enact the most powerful learning. If the way we talk to our students is undermining their identity as agents of their own learning then we have fundamentally undermined the learning. Helping to build a sense of agency must therefore take priority both at school and at home. Authoritarian technocratic teaching can produce learning at some level demonstrated by students who may pass an exam or score well on a standardised test however that learning is the lowest form of learning. It is rote and unsustained. It undermines student identity as agents of their own learning and is therefore destructive by undermining the potential for that student to learn when the authority structures of school are not present. Affirmations throughout the process of learning must therefore be focussed on building this sense of agency. Praise should take the form of feedback that notices the attributes of a thinker, a writer, a mathematician, a problem solver, and of a failer who returns to a challenge. This kind of praise affirms their identity as a protagonist in their own story. “Choice is central to agency” p.36. When managing behaviour that is unsatisfactory, highlighting a learner’s choices opens the discussion for imagined options and alternatives. What they did does not need to define their future identity because we affirm their authority to make choices. In this way, even when addressing behavioural challenges, we are building their ability to imagine options by affirming choice rather than demanding compliance and submission. They are less likely to give up. They are better at planning. They are more likely to choose challenging tasks. They have improved concentration when difficulties are faced. And the process is iterative, that is, it creates a positive cycle of success. A focus on building student identity as agents of their own learning is not an add-on to the curriculum or something to schedule in for focus during different lesson times. Rather it should be a fundamental driver of how we relate to learners all day, every day. Building student identity cannot be achieved through a programme or package. It must be a disposition that defines everything about what we do and how we set the scene (literally and metaphorically) for learning. I do not doubt that learning can and will happen without it but that learning is limited, shallow, unsustained and unlikely to lead to more learning. Learning that occurs in a context that affirms learner identity as key agents in their own lives is orders of magnitude beyond enforced rote learning. It is so far beyond submissive learning that it is altogether an entirely different experience. The levels of engagement, the type of thinking, the creativity, the brain development and the impact on future learning is so dramatically different that, in contrast, learning that happens under duress can hardly be considered to be learning at all. Such as the difference between a snow-globe and the experience of standing in a forest watching snow flakes shimmer about you and ever so gently kissing your cheek in a fleeting moment, the experiences cannot be compared. Through citation and attribution of students’ own work their identity as valued producers and creators is affirmed. For example, I encourage students to cite themselves when they use their own photos in their work or if they interview their peers they can create a citation that accurately takes account of their role. Just this simple citation process gives them a sense of accomplishment, a “like” that acknowledges their generative act. “I feel famous”, they have said to me. For a student selecting a book from the library that is way too difficult for them, is it more important that we enforce an approach that overrides their choice or alternatively should we adopt an approach that affirms their actions to search, consider and select a book for themselves? The later will lead them to return where the former will not. If reading level is a barrier to successful reading for them, we need to find creative ways to introduce them to more accessible texts and find new ways to enable moments of discovery that are always affirming their right to choice because this is far more important than what we think they may need. Early Years students reading non-fiction texts in pairs. Affirming their identity as capable readers and collaborators. Affirming student identity as readers is critical. A reader is not just someone who can decode text. It is someone who searches, ponders, and selects reading for themselves. Successful readers merge across a variety of text types (including images, illustrations or video) via a range of media. Avid readers are avid readers across the many forms of text available to them. Therefore, we need to be careful to affirm reader identity as the ability to switch between media and merge text experiences. For example, I start this with 3-4 year olds reading in pairs where together they analyse images, infer meaning, hypothesise, collaborate and share their new insights. This is long before they can decode text yet it affirms their identity as capable readers who aspire to discover more in the texts they encounter. Another very powerful affirmation of students as writers and authors is to catalogue books they have made themselves so they can be barcoded and entered into the library. I never edit or alter their texts, I only inquire into what they have created. 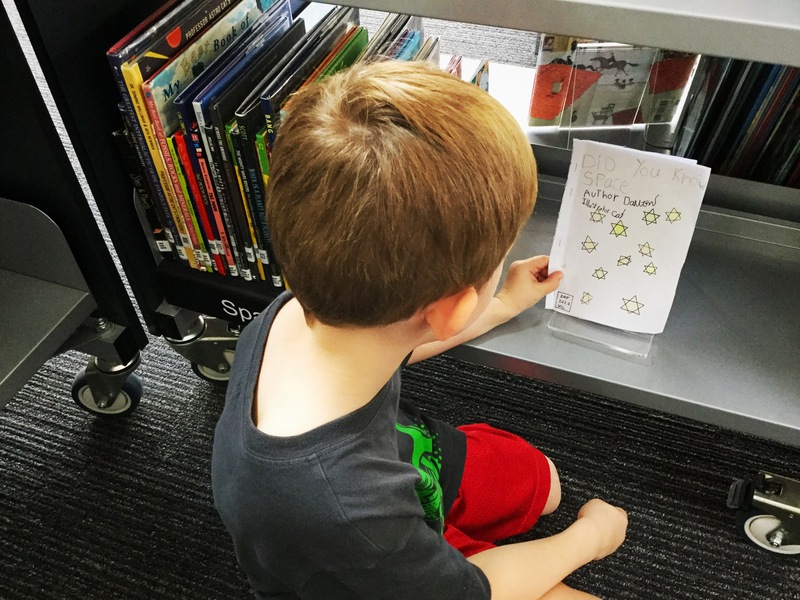 A Grade 1 proudly placing his new book on the shelf in the library. As we catalogue their book together we talk about subject matter, genre, target audience, summaries, why they think other children will like their books, and where they would like the book to live in the library. Never judging, only inquiring. Almost invariably there are peers witnessing this process who are observing how literature can be discussed and understood, all in the most powerful context of affirming a student’s identity as a writer, an agent in their own creative process. The spelling, grammar, illustrations and general binding (usually a spray of staples and trimmings) are never modified or judged but we do discuss these elements and improvement is always observable with subsequent publications. Recently a grade 1 student who is leaving our school in 4 weeks time informed me that he would like to take his books with him to be entered in the library of his new school. This is agency at its finest! 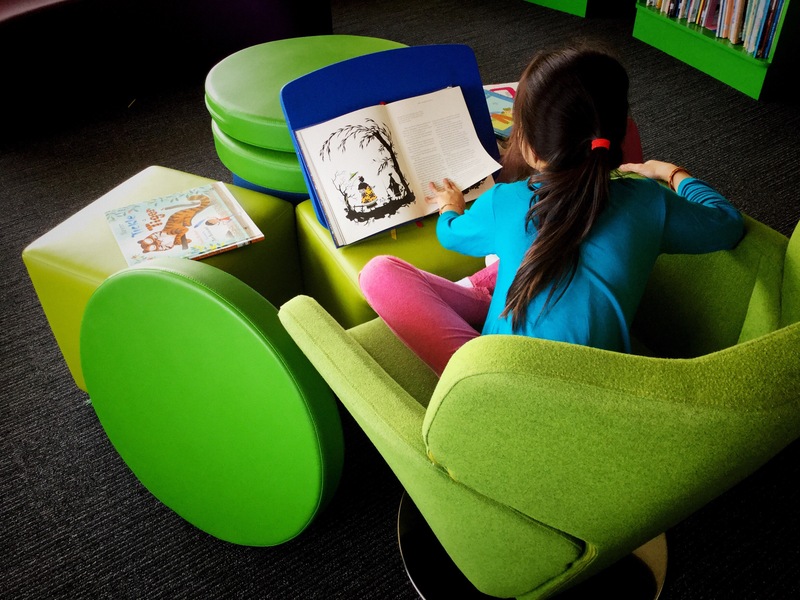 Students who craft their own reading space are crafting their own identity as readers. I can thoroughly recommend acquiring a copy of “Choice Words : How our language affects children’s learning” because it is a text that you will keep coming back to again and again. At only 90 pages in length, it is as concise as it is practical and profound. Previous PostProxemics and The Embodied Mind: The hidden dimension of learning.Next PostRebranding libraries 2 : in with new, in with the old.